Eternal Command is a deck with heavy tempo elements that can play a midrange/control back up plan. Aether Vial, Tarmogoyf, Remand and Lightning Bolt are superb tempo cards and recursion with Snapcaster Mage or Eternal Witness and Cryptic Command make sure we can 'get there' while enabling a powerful lategame softlock by casting Cryptic Command over and over. This recursion can either lock the opponent out of the attack step, or prevent them from resolving one spell per turn. It requires an Eternal Witness in play, and a Cryptic in hand. With the Cryptic you return Witness to your hand and use the other 3 modes on Cryptic to your benefit. Then you can vial/recast Eternal Witness returning Cryptic to your hand and can repeat this process again. Snapcaster Mage can do the same thing albeit not indefinitely. With that loop, you can see how the deck got its name. This deck was first popularized by Shouta Yasooka at the 2012 Player’s Championship. He played it to a 5-1 record in the swiss, made it to the finals of the tournament, but lost in the finals against Jund, a deck he beat twice in the swiss. Shortly after Scavenging Ooze and Deathrite Shaman were printed, Jund took over the modern metagame and Eternal Command faded into obscurity. Since then, the deck popped up here and there but Splinter Twin was notably just the better Tempo/Control/Combo deck. The latest big finish was in February 2017 at a 180 man Face to Face Open in Toronto. This is an updated Primer. The old one can be found here. Overall you should know that this deck includes two cards that want different deckbuilding decisions. Aether Vial obviously wants you to play lots of creatures while Snapcaster Mage wants lots of spells. It's an ambivalence that the deck tries to get around by playing lots of cantripping spells and the tendency to bounce own creatures for value, thereby virtually upping the creature count for Vial, which leads to us getting away with less creatures than common for a Vial deck. A split of 13-16 creatures and 20-22 spells is the norm. Essential for the strategy. It enables the Eternal Command soft lock and helps us to play mostly at instant speed. Also solidly helps out tempo game. Play 4. Essential for the deck. Let’s us play the tempo game while being solid defense against fast decks like Burn. It’s also one of the best answers to opposing Goyfs we have. Play 4. One of the namesake cards of the deck that enables the softlock. While Shouta played the full 4, the card can be a little clunky and you don't really want multiples in your starting hand. More recent lists tend to play 3. In a format as fast as Modern often actually the better card over E-Wit. Everybody knows how good Bolt/Snap/Bolt is but he has a lot more nice synergies in this deck (Familiar's Ruse, Cryptic Command, turn 1 Vial, turn 2 Remand, turn 3 Vial in Snap and recast Remand etc.). I would advise to play 4x, but sometimes you get stranded with multiple Snaps and E-Wits in your hand without anything relevant to get back, so an argument for only playing 3x can be made. Flash, helps you to time your counters correctly, solid tempo threat. The card is very good and stuffs some wholes in our strategy (getting through chumpblockers on the ground, being able to play it at instant speed when you don’t have a Vial out, additional threats to the 4x Goyf). Play 1-3, 2 is usually the standard choice. Another card that rounds up some issues the deck has. Especially spicy if vialed in in response to opposing Snaps, Lingering Souls etc. The card helps to stabilize against aggressive decks, is very solid in many attrition based MUs and can help against big butted creatures like Goyf and Tasigur. Value topend with a very nice Vial synergy (vialing him in can directly flip him the next turn). Ticking Vial up to 4 makes it unable to be used for the soft lock though. As Huntmaster can win games against certain MUs by itself (any attrition MU, especially against small creature strategies) but tends to be clunky in others (Modern is fast) he is often used in the SB and not MB. In certain fields MD inclusion can make sense though. Play 0-2. The best blue cantrip in Modern. Helps you dig for the right cards when you need them. There are actually lists that only play 2x. I think that's wrong and would advise you to play 4x all the time. Shouta played 2x to ditch unnecessary Vials and get rid of the wrong answer at the wrong time (an answer in the grave can still be easily recast later with Snap/E-Wit when necessary). People have moved away from the card though. EC usually only runs 4 artifacts in Vials and drawing a second one isn't really that bad since you actually want a Vial on 2 and on 3. Given these circumstances Thirst tends to be clunky. Run 0-1. Between Cryptic Command, Eternal Witness, Snapcaster Mage and more this deck already has plenty potential to grind and by running 4x Aether Vial we already got ourselves 4x cards that are awesome on turn 1 but get worse and worse throughout the game. Adding another 4x is just ruining your topdecks later on. 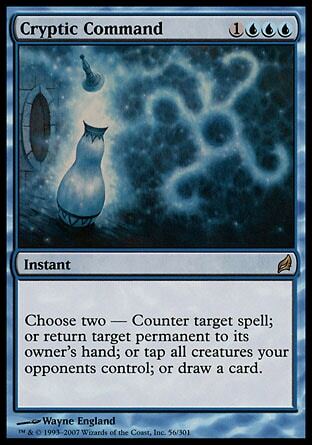 Namesake card of the deck and one of Modern's most powerful and versatile counterspells. This deck is optimized to abuse this card. A point can be made for it being expensive and multiples in your starting hand can prove clunky though. Play 3-4. Very good tempo card that draws us through our deck while delaying the opponent, buys time until Cryptic gets online but isn’t very good against fast aggressive decks. Depending on the meta play 2-4. Modern go to 2cmc 'hard' counter. Generally synergizes worse with the deck than Remand, which is why it sees less play. Can obviously be good in the right meta though. Play 0-2. Spicy mana leak alternative and 'little' Cryptic Command. While it's usually not online until turn 3 or later the value this card can provide with Snapcaster and even more so E-Wit should not be underestimated. Without a creature on board it's dead in hand though. Play 0-2. With the amount of strong 2-drops in Modern this card has been solid for years but recently dropped in popularity since Death's Shadow took over the meta. Play 1-3. The reason to be in RUG. While it’s at an all time low right now, Bolt is a huge enabler for our tempo plan and with adds a lot of reach to the deck with Snaps and E-Wits. Play 4. 3cmc is a lot in the format but this card really helps against go wide and attrition strategies. Play 0-1. Buys time against big butted threats and can safe your own ones or just simply let you reuse your Snap/E-Wit, very flexible. Play 0-1. A way to get rid of Eldrazis, Tasigur, Anglers, Rhinos and small Goyfs. The phyrexian mana makes it very tough to recast and a pretty bad card against aggressive MUs though. Play 0-1. Similar to Dismember but can only kill at sorcery speed. With Shadows and Goyfs bigger than x/5 running rampant currently, Vapor Snag has become the go to 1x removal. Play 0-1. Some metas make a 5th Bolt effect useful and these three generally do the best job at that. Play 0-1. Thanks to Vial this deck gets to play a pretty low land count of 20-21.It’s primarily a blue deck, then green and only a red splash. We start with Modern's 'standard' 3-colour-manabase of fetches, shocks and basics. Being mainly blue 3x Islands are recommended, usually accompanied by 1x Forest and 1x Mountain. Play at least one of each, maybe 2x Breeding Pool. This basis for our landbase should then be supplemented by a combination of fastlands, Filterlands and sometimes manlands or utility lands. Eternal Command is a very colour intensive deck, so lands that only produce colourless should only be played as a singleton unless you play with more than 21 lands. The perfect fastland for this strategy, painfree Bolt or SV on turn 1 is great. Playing too many fastlands can lead to not having Cryptic up on turn 4 though. Play 2-3. Very good fixer for Eternal Witness, Cryptic Command and Scavenging Ooze that can even cast Vials on turn one. Can be awkward if you want to play multiple spells in the early game though and drawing 2 in your starting hand is a mull 99% of the times. Play 1-2. The go to manland for the strategy. Since we usually want to hold up counters, manlands aren't as good in this strategy as in other midrange decks. Sometimes it just wins you the game though. Unless your meta is very grindy, playing a maximum of 1x manland is recommended. Slightly better than Lumbering Falls in a vacuum, the card sadly doesn't produce blue mana and we really want to keep the count of lands that don't produce blue mana as low as we can (maximum of 3x) to not run into problems casting Cryptic Command. With Snapcaster and E-Wit, Eternal Command can profit a lot from only playing 1-2x answers in the deck because chances are good you can recast it a little later on. Playing lots of cantrip effect helps to find the answers. That's why it's very common to play less copies of SB-cards but rather similar cards with slightly different effects covering more ground. Go to 'classic' sweeper for the deck. While being solid against go wide strategies like Elves or Merfolk the card pulls double duty against Dredge and Collected Company decks. Sometimes rr can be tricky on turn 3 though. Faster than Anger and easier to cast but less good against Company decks and a lot less good against Dredge. Just like Pyroclasm the card is easier to cast than Anger but useless against Dredge. Gets bonus points for being good against Affinity though. Different kind of 'sweeper' that is obviously amazing against (Lingering Souls) tokens but also pulls it's weight against Affinity and Elves. Very different from the other sweepers this one can deal with noncreature permanents as well and generally very versatile. Good against tokens, Elves, Bogles, Lantern and Merfolk. The fastest 'land destruction'-spell we have access to. Deals with annoying utility lands, manlands, buys time against Tron and even draws us a card on top of that! Modern's go to 'Stone Rain'-effect profits from the ability to be vialed in, but can only be used repeatedly with E-Wit. RR can be an issue. Usually just as good as Fulminators and can be played again with Snapcaster for that double LD on turn 3 and turn 4 (with Vial). RR can be an issue. Molten Rain that is easier to cast but doesn't shock your opponent. If your landbase is light on red, playing these over Molten Rain is often actually the better choice. Good against other decks with counterspells, good against burn, good against Ad Nauseam, very solid card. It's rarely wrong to play at least 1x. More expensive than Dispel but with broader applications. Between Eldrazi Tron, Gx Tron, Affinity and Lantern Control there are lots of decks with tons of colourless card that often even tend to be expensive. Solid card as the latest GPs have shown. With Storm running rampant on MODO the card is a neat trump. Also very solid against Ad Nauseam and generally decks that play counterspells. Pretty much the go to Haymaker for this deck. We can flip him back and forth quite easily and even vial him in so that he flips directly and can just win games by himself. Especially good against value creature decks, the card shines in attrition MUs and is a solid way to stabilize against Burn. Pretty expensive with 5 mana, he will often just win you the game if he resolves in attrition MUs. Only run him in a very grindy meta though. Another great value card that can get absurd if bounced to hand again. Again Huntmaster is usually the better choice unless you expect a very grindy meta. Probably the second best hate against Affinity (after Stony Silene). Play at least 1.
efficient answer to many SB cards that are boarded in against us, especially Rest in Peace. Hits every enchantments that relevant against us except Leyline of the Void. Hits even Leylines but costs double as much as Natural State. 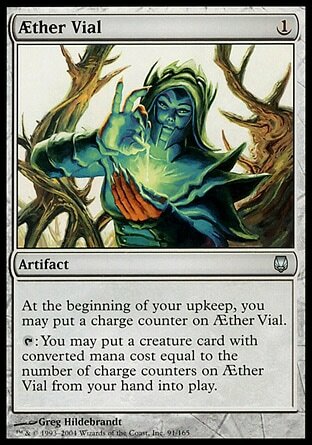 Another very solid card of Affinity hate and the one you choose if you really hate Lantern Control. Usually keeping your Grudge Ancient is better though. Solid card against Snapcaster decks, Abzan Company, Reanimator stragegies, opposing Tarmogoyfs and Delirium cards and other stuff, especially sweet if vialed in. Can be too slow for decks like Dredge though. Since Relic of Progenitus exiles both graveyards and we usually try to avoid that this is an option against decks that fill the yard faster than Scavenging Ooze can keep up with. Exiles our own yard but cantrips. Rarely sees play in EC. Found it's way into a lot of Modern's SB recently, strong card but synergizes a lot better with targeted discard than counterspells. Shuts down our own Snapcasters but hurts Dredge a lot more. Valid choice if the meta demands it. Very versatile and another card that is especially good if vialed in. The MUs is shines against (Infect, Bogles, etc.) aren't played as much as they have been though. Goes 'infinite' with E-Wit. Grindy card that's also solid against Burn. Very solid allrounder against Planeswalkers, manlands, Affinity and others for just 1 mana. As most for Modern decks, G1 is an uphill battle, but beatable with a good hand (Bolts, Spell Snares, Electrolyze, Snapcaster all do a good job). G2 is a lot better, but still depends on how well prepared your SB is for the MU. Burn: Depending on your MB configuration (any lifegain?) the MU varies between slightly positive to even. We don't have any meaningful ways to deal with their beaters besides bouncing or tapping them, which is definetely a problem. The MU isn't as bad as that makes it look like though, because of our ability to easily turn from defense to offense. Let them do the work in hurting themselves until their under 10 life and try to set up a turn where you deal 7+ damage on the back of vialed in Goyfs, Cryptic tapdown, E-Wit, Snap and Lightning Bolt. The better the DS pilot is, the harder is the match. Slightly better than the MU against the Jund version, because Grixis packs less threats, they tend to come down later and our Remands aren't useless against delve threats and Snaps. Very skill intensive, even to slightly favored MU. Thanks to less copies of Cavern of Souls a lot better than the MU against the Bant version, but you really need to close the game out fast here. Drop a threat and ride him with your counterspells to victory. Slightly unfavorable MU. They rip our hand apart and pretty much all the stuff they play is a problem for us (Goyfs, Lingering Souls, Rhinos etc.). Still feels like a cakewalk if our answers line up well, but as soon as they don't...unfavorable MU. The deck improved a lot with their new infinite mana combo, but Bolt+Snap have always been a good duo to fight small creature decks and SB cards like Anger of the Gods and Huntmaster are really good in this MU. Slightly favorable. This deck's worst MU. We have a problem with dealing with big butted threats and against this deck we can't even counter them. Unless they brick it's pretty assemble the lock or bust. very unfavorable MU. Remands and Cryptic Commands are very good against them dropping their key cards. It's important to be able to finish the game quickly (Goyf, Clique) though or they will just get you with Valakut triggers. Favorable MU. As for every fair deck in Modern, beating them game 1 is very tough, but the Cryptic Lock is a valid out, just be aware of Conflagrate. Game 2 and 3 obviously depend on how well you are prepared to face the deck. Slightly unfavorable to unfavorable MU. We like to play the tempo game and tempo is pretty good against linear combo. Drop a threat and keep counters up. Just be aware of Pact of Negation and try not to only have one counter up when they are about to combo. Favorable MU. Between Snaps, E-Wits and Commands we have lots of grinding potential and Vial is a big trump card for us. Depending on the opponents build, even to slightly favorable MU. So i've been playing Eternal Command for a long time, but never was on board with the red version especially because bolt against a lot of decks cant get the job done so I've been running bant and loving it. My list is a lil spicy but works wonders. I am really interested in this deck and considering buying the cards to play it at my local fnm. But I have got a question: Isn't the Eternal Witness /Cryptic lock easily disrupted by any removal card? They can simply destroy our Witness in response to our Command or am I missing something? Yeah its not a complete hard lock, it can be disrupted but if your able to establish Vial on 3, with cryptic most of the time you can tap bounce on upkeep or do other interesting tricks. Also thats why I like the bant version with Spell Queller because it can disrupt them even more. Wow now that's why I didn't found the primer in Deck Ideas, awesome to see we got bumped up! Your completely right, and I think that's actually one of the big mistakes players do when picking up the deck for the first time. The Softlock is an out, not the main game plan. Tempo them out usually is the main gameplan. Thanks for the tip Raven! Although not many were watching it's always good to see people still playing the deck! Sounds like a good idea to me. You got any links with videos that are good to watch? I knew about the TCG and MTG Goldfish videos, haven't watched the over ones yet. We won't see the card until fall, but man I like this. Obviously good against Death's Shadow, but still solid against decks with smaller creatures like Burn, manlands and tokens and has huge blowout potential. Opinions? Exactly what I was thinking. It still doesn't help against them pesky Eldrazi, but since it's instant speed you can created very nice blowouts against decks that are attacking you with small creatures. Seems very solid to be tested as a 1x-2x in the main. If only we wouldn't need to wait for it so long. Well maybe Hour of Devastation has something nice for us! It's a lot more flexible than Threads of Disloyalty since it can't be hit by Abrupt Decay and is an instant, which means it can be flashed back and has big blowout potential. Pretty much every other fair deck in modern runs removal that's dead against decks like Ad Nauseam (Push, Terminate, Path...). I always considered it a secret strength that we don't, but having 1-2 mb doesn't seem too bad. It's not good against Eldrazi Tron, but it's not dead either. It kills Walking Balista for UU and sometimes you should be able to steal a Matter Reshaper, potentially leading to positive surprise blocks for you. Definitely not decent, but not dead either. It's been a long time since we got a card that's playable in the main...maybe I'm just hopeful? Not sure if it's better, I wish cycling it would cost 1U. Off the top of my head it hits Fetchlands, Planeswalker Activations/Ultimates, Arcbound Ravager, Khalni Heart Expedition, ETB Triggers of all sorts, Oblivion Stone, Suspended Cards, Storm and there's probably more! I went 3-1 with the deck during FNM last Friday, wanted to write a report but really have the time currently sadly. I beat Eldrazi Tron, Grixis Shadow, Mardu Midrange (tons of spot removal, targeted discard, Souls and Nahiri) and lost against dredge (which was close, almost beat him game one on the back of Scooze). I tried out 2x Narnam Renegade (coming in for 1x Finks and the 4th Cryptic). They came in handy against both E-Tron and Grixis Shadow but costing 1 is actually awkward with Vial and they are obviously way better early in the game than late. I tried 2x so I actually draw them but will probably continue with 1x and see how that goes. How do you guys feel about Electrolyze lately? While it's an old favorite of mine I'm not sure if it's efficient enough anymore. Opinions? This time I played against someone who just picked up the deck fairly recently and made some misplays because of that. Not sure if they changed the outcome of the game but a thing to note. Overall I'm actually positive against Eldrazi Tron, not sure if I should be (meaning not sure if the MU is really positive for my list) or if I was just lucky so far, but the MU is definitely better than Bant Eldrazi and so far I think even better than good old Gx Tron. Less Caverns means our counters, especially Remand is online a lot more often, no on cast triggers are also awesome for our counters and the deck has less consistency in finding Tron than Gx Tron has. No Oblivion Stone means Spreading Seas is awesome in disrupting their lands and Ceremonious Rejection is actually a solid SB card against the deck too. Oh and Narnam Renegade did a very solid job in dealing with TKS and RS so far. Sometimes they just have nuthands with 2x Temple or natural Tron and then it's really hard to stop them, but usually I get to play an interesting match. On another topic, is there gravehate in our colours that's good against DSG, Dredge and Living End? Scooze maindeck is nice but often too slow or it just gets killed. Relic of Progenitus is very awkward with out own graveyard and Surgical Extraction isn't really that good against LE and seems mediocre against DSG too. Scrabbling claws or tormod's crypt is basically it as far as real graveyard hate goes. Theres also ravenous trap, but thats questionable at best. Scrabbling Claws seems definitely not fast enough against Dredge, probably not even against DS. Loaming Shaman comes down too late there as well. Guess I'm stuck with Tormod's Crypt. Not sure if that's worth running, gotta see if more Dredge shows up at my LGS in the future, but thanks for the suggestions! I someone on reddit suggesting Diminish as anti Shadow tech. As the targeted creature keeps its abilities Shadow dies instantly from it, same goes for other cards with -1/-1 on them like Devoted Druid or persisted creatures. Also lets us block or attack into stuff like Tas/Angler, Eldrazis (especially TKS), opposing Goyfs and more...opinions? Snakeform is a card, but three mana is a lot. So if somebody really hates green he can drop it now and play Bloodwater Entity instead. Way better body but I don't think missing your draw every turn for the softlock is worth that. Edit: There is some cute interaction with Devastation Tide though. Hi, I've been playing BUG vial for a while and i'm very fond of nihil spellbomb and leyline of the void. another interesting thought i had for my board was with life from the loam, and raven's crime. i always like to keep a ghost quarter(or two) in my main so it just made sense to try and abuse that. a lot of players will go after the blue sources you have, and i seen another variant abusing dark blast and crucible of worlds. both of which interact with the combo, and that's the fastest way back to you're sources if they get blown up, feed ooze, murderous cut, and allow you to tool box with witness/snap. a newer card i have yet to try is Kefnet the Mindful. it is kind of easy to get a grip after you resolve a LftL. black will also grant abrupt decay and fatal push, and its kind of important to keep a balance here because one hits man lands and one doesn't. because of these cards, picking man lands becomes a little more difficult between lumbering falls and creeping tarpit. i know there is no bolt so you can use the tarpits to direct at walkers, and/or falls to avoid removal. that part is kind of meta dependent for aggro games or grindy games. yea, just so u know im not very good at posting full list but i will tries. cavern of souls and tron lands need an answer. you can also go with creeping corrosion over a damnation if you like because they can be the same or answer other MU differently. if you don't see a lot of tron in your meta, you don't HAVE to use ceremonious rejection. something like negate works. Your BUG list looks like it has the typical problem I encounter when I brew up one...does it even make sense to put the Cryptic, Vial, E-Wit solftlock package in there? Or wouldn't the deck be just better of being a sweet BUG midrange deck? You run 2 GQ main and want to have U/B one turn 1, GB and 1U on turn 2, 1UU and 1GG on turn 3 and 1UUU on turn 4? That's hella greedy and even worse than the already greedy RUG manabase. You're only playing 2x E-Wits, no Traverse and less cantrip spells (Remands, Electrolyze etc.) than RUG, the lock won't come together that often. Is that really worth playing a super tough manabase and 4x bad lategame topdecks (Vial with only 12 creatures)? I like your list RobintM, I love bant colors, if you keep playing this let me know how it goes! I would love to get that lock going. I think Glory-Bound Initiate has some good synergy with bouncing it back to hand and then flashing it in with vial. I think if I were to play this list I'd play 2 Glory-Bound or Selfless Spirits. I'm pretty new to this archetype but what are the advantages to playing the traditional Temur lists over Bant or Sultai?